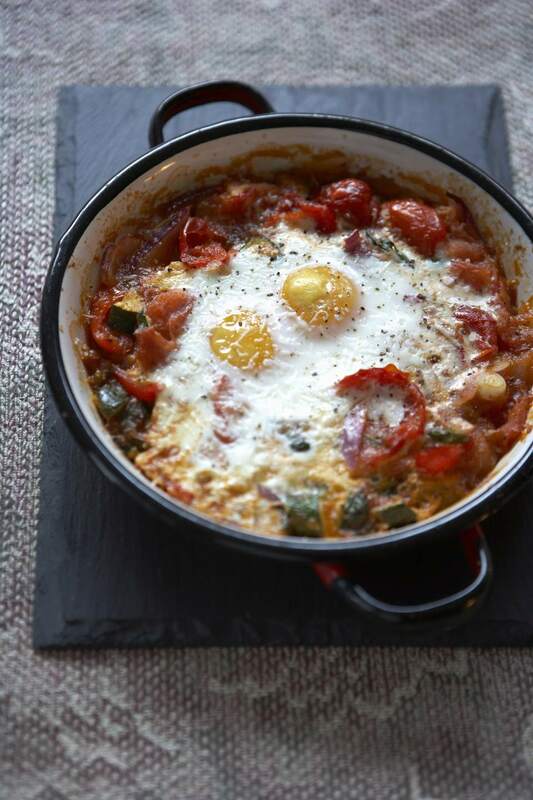 Eggs in purgatory is a recipe that hails originally from Italy. Due to its popularity in many Spanish and Latin American homes, we decided to share our own version of it―with a Spanish flair. Eggs are baked in individual ceramic dishes on a bed of tomato sauce with diced Spanish chorizo sausage and topped with grated cheese. This easy recipe is perfect for a main meal. If you have a big enough clay dish, you could even bake it for family style serving. You could also make individual servings for a hearty hot tapa. Whether you enjoy this dish for breakfast, brunch, lunch, or dinner, this versatile recipe is a go-to last-minute meal in many Spanish homes. Finished in less than 30 minutes, it's a perfect mid-week meal. Peel and finely chop the onion and garlic. Thinly slice the chorizo sausage. Slice the roasted red pepper into four pieces. Pour the olive oil into a large frying pan and place on medium heat. When hot, sauté onion, garlic, and chorizo sausage in the pan until onions are translucent and soft. Stir in the red pepper flakes, thyme, and oregano. Add the crushed tomatoes and simmer for approximately 15 minutes. Divide the tomato sauce into the four individual ceramic dishes (or one large baking dish). Press a spoon in the middle to create a hole for the eggs. Break 2 eggs into each dish and sprinkle with cheese. Bake until the whites are set, but the yolks are still runny. Serve with bread or homemade fries.